This lovely Latin lamb shanks recipe is the result of a little experiment I just did with the help of my friends from Imusa. You all know how much I love my Le Creuset Dutch oven, but I realize the high cost puts it over the budgets of most home cooks. So, I was interested to see how this "caldero," which costs under $30 would perform. The model they sent me looked like a Dutch oven, but was so incredibly light that I really wasn't sure how it would work. I assumed the caldero would be fine for the browning step, and it was. My main concern was would the ultra lightweight lid be heavy enough to keep in enough moisture? To my surprise it did very well. As you'll see, we only add a cup of broth to braise the lamb, and it didn't even come close to drying out. So, if you are looking for a really light and inexpensive Dutch oven, this one performed well in regards to cooking the food. Of course, I can't give any opinions on the durability, and how this would stand up to normal wear and tear, but you can check online user reviews for those issues. The recipe itself is very straightforward. You don't often see lamb cooked with these spices, and I'm not sure why, as they really work together wonderfully. The final plate ended up being a sort of North African/Central American fusion thing, with the fragrantly spiced meat and peppers resting on a simple bed of couscous. Please note: I was using relatively small lamb shanks for this recipe. If you are using larger hind shanks, then you will need a longer braising time, probably 30 minutes more at least. Either way, I hope you give this comforting lamb recipe a try. Enjoy! Disclosure: Imusa sent the caldero to me free of charge, and also contributed to the production costs of this video recipe. For more information on this product you can contact Imusa directly, or check out the product page here. Thanks! good to hear that the inexpensive brand of dutch oven works just fine. because, i can't afford a really expensive one right now. Looks good!...Would this also work with veal?...other than the longer cook time? thanks for including your ambivalent approval of Imusa's dutch oven. I was talking about this with a friend a few months ago but I didn't have the money for the hundred dollar units at the time. 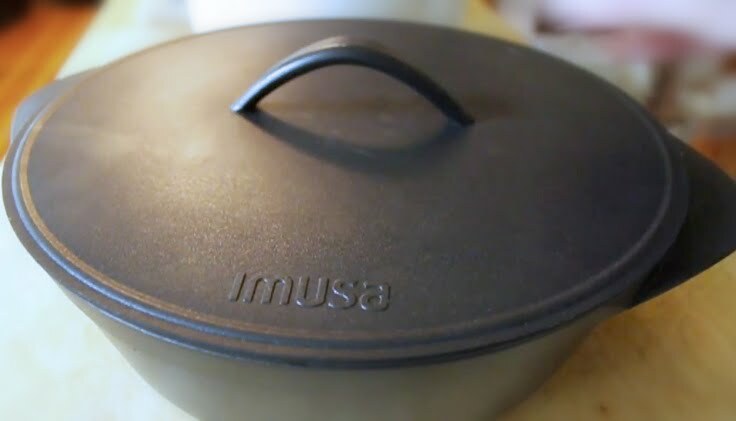 I will definitely be buying the Imusa oven soon! We want to be free! We want to be free to do what we want to do! We want to be free to ride. And we want to be free to ride our machines without being hassled by The Man. Hi Chef John, I love your blog and just wanted to give some advice about dutch ovens. There are a few reasons why this oven isn't as good as a Le Cruset. First of all, sometimes it is hard to judge the color of the fond on the bottom of a dark pan, which can mean risking it getting burned so you would have to clean out the pan and you wouldn't get the deep flavor from those browned bits. Second, it is not advisable to make tomato based braises in these because they do not have the ceramic coating and the tomatoes might react with the metal and leave a slightly metallic flavor. Having said this, I'm sure that for most of us this sort of dutch oven works great, especially with that price. Another cheap dutch oven I recommend is the 6-quart lodge ceramic coated dutch oven. I bought mine off of amazon for 50 dollars and it seems to work just fine. Hope this helps. Thanks, but if course the Le C is superior. This is just a super light and very cheap alternative. Wasn't trying to say it was the same, just that this recipe came out great. biggest diferrence is... heat holding and that enamel easy (or I might say easier, as calderos are pretty easy cleaning) cleaning. and yea, we use it daily for rice, or pot roasting chicken, stews, and even deep frying. Chef John, would love to make this for our guest this weekend of which there are 9. Would like one shank per person. Is it possible to stack the shanks in the dutch oven? In theory it will work if you can fit them, but the ones in the liquid may cook differently from the ones on top. Maybe rotate them a few times. What quart size is your Le Creuset? All comments are moderated! Just leave once and wait for approval. Thanks! You add to make the stock but not in the finished bisque.